Germany says it would be inappropriate for Turkey's President Recep Tayyip Erdogan to address Turks in Germany during the G20 summit next week. German Foreign Minister Sigmar Gabriel said Turkey had made such a request officially, but "it's not a good idea". "We have constitutional justification for doing this," he said. Hamburg will host the G20 on 7-8 July. Turkey was angered by Germany's refusal to let pro-Erdogan politicians address campaign rallies in Germany in March. 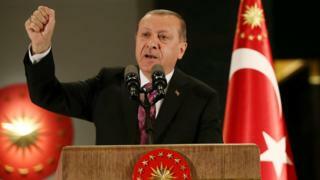 Mr Erdogan castigated Germany for the ban, accusing the government of "Nazi-style" behaviour. Turkish ministers wanted to woo Turkish diaspora voters ahead of the April constitutional referendum, in which Mr Erdogan won sweeping new powers. German-Turkish relations remain tense. The two countries are Nato partners, but Germany has decided to relocate its aircraft from Turkey's Incirlik airbase. German politicians, and many others in the EU, have condemned Mr Erdogan's crackdown on dissent since a coup attempt against him in July 2016. Mr Gabriel told German media that "on the sidelines of the G20 we don't have the police numbers to provide the security" necessary for Mr Erdogan to address Turks. He said "ours is an open country, but we have no intention of bringing other countries' internal political conflicts into our population". 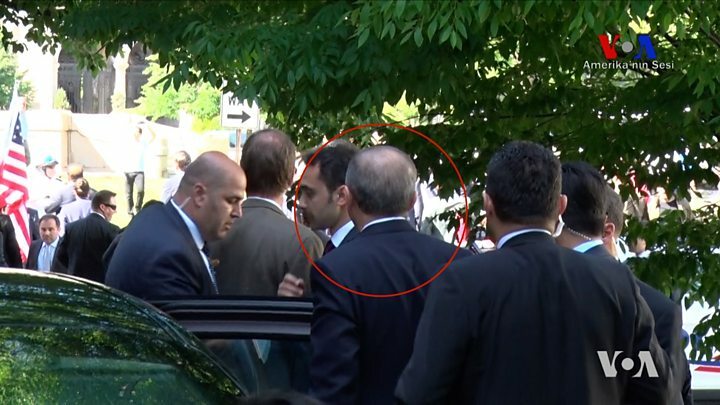 The chairman of the Turkish Community in Germany (TGD), Gökay Sofuoglu, backed Mr Gabriel's stance, saying "I want it clearly stated that such a mass event will not be allowed here in Germany", the Handelsblatt daily reported. Germany has also warned Turkey not to bring Turkish security agents who were charged for violent scuffles in Washington last month.